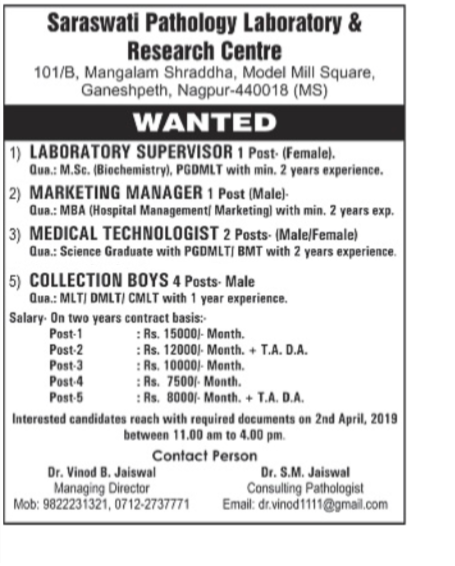 Saraswati Pathology Laboratory Nagpur (Saraswati Pathology Laboratory), Nagpur published a new job notification for Laboratory Supervisor, Marketing Manager, Medical Technologist, Lab Assistant, Collection Boys Posts. The recruitment is for total 10 Vacancies. The willing candidates are informed to see the latest notification April 2019. Walk-in-Interview on 2nd April 2019. For More details of Saraswati Pathology Laboratory Nagpur Recruitment 2019 Read Below. Interested & Eligible candidates may attend for walk in interview along with all the documents addressed at 101/B, Mangalam Shraddha, Model Mill Square, Ganeshpeth, Nagpur- 440018. Walk-in-Interview Date: 2nd April 2019.